With the warm weather, parents are out in droves pushing their young ones in strollers. I went through my books and found some details to show you. The strollers are made with wire frames and button wheels. 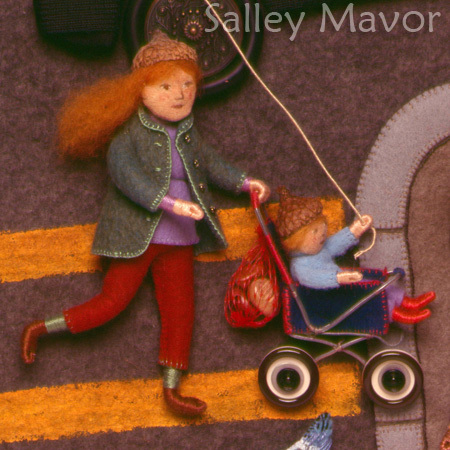 This first one with the red-haired mother is from my 1997 picture book, You and Me: Poems of Friendship. Here’s a stroller from another page of You and Me with a baby that’s about 1″ long. This mother and child is from my 2001 book In the Heart. Autographed copies are available here. 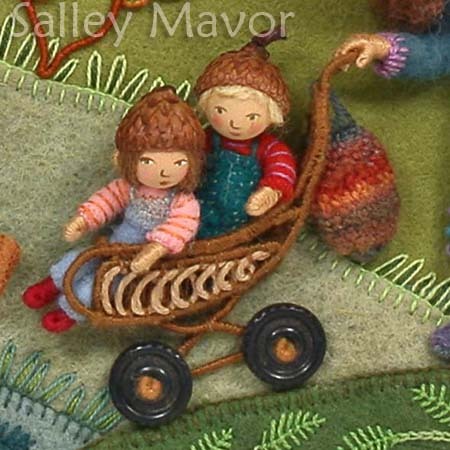 This double stroller is being pushed by the old woman who lived in a shoe, from my book, Pocketful of Posies. The children are about 1 1/2″ tall. 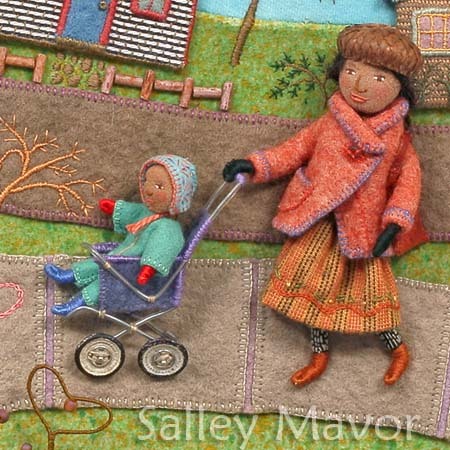 This entry was posted in Children's Books, Closeups, Fabric Relief, Felt, Found Objects, illustration by Salley Mavor. Bookmark the permalink. Beth, I hope that you can come see the exhibit at Highfield Hall in Falmouth this fall. It’s only and hour and a quarter from Providence! I love your work soooo much! All the details you put are incredible. I am always happy to receive your post. You just continue to delight and amaze me, looking at one of your posts just makes my day!! Salley, you are simply magical! The strollers are over-the-top wonderful! Cannot wait to see the new book! One more reason to shop for buttons- stroller wheels! I love the little hand that is on the double stroller in the last photo. Beautiful! oh my gosh Salley, I just came across your blog and I am sooo inspired by your amazing work!! I just loooove all the fabulous details and textures and marvel at your craftsmenship!! I do plasticine illustration and have a love of textures and details too, so your work reallllly inspired me!!! I will visit often! Welcome Suzanne! It’s nice to connect with another 3D illustrator. You are so amazingly inventive! Love it!